India for first time is going to host ICEGOV 2017 (International Conference on Theory and Practice of Electronic Governance). This year it is the 10th edition of ICEGOV and it will focus on the use of technology to transform relationships between government and citizens, businesses, civil society. This conference will be hosted in collaboration with United Nations University and UNESCO. 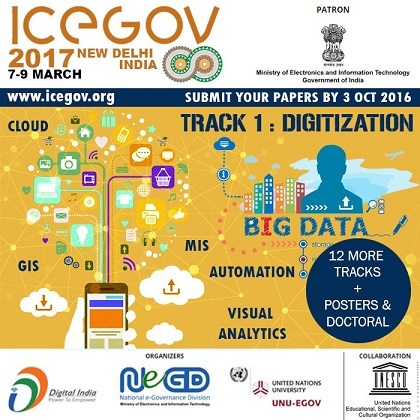 Objective of ICEGOV 2017 : To explore how Digital Government can lead to Digital Empowerment by local knowledge. The West Bengal Government has recently passed the West Bengal Clinical Establishments (Registration, Regulation and Transparency) Bill, 2017, by a voice vote. It repeals the West Bengal Clinical Establishments (Registration and Regulation) Act, 2010. It aims to overhaul private healthcare in state and take stringent measures against health institutions accused of medical negligence and corrupt practices. For the first time in 16 years, Odisha has achieved highest decline in Infant Mortality Rate (IMR). This decline is far better than the national average. According to the fourth round of the National Family Health Survey (NFHS), Odisha’s IMR has come down by 29% between 2005 and 2015 which is highest trend in the country. Note : It was 96 per 1000 births in 2000 has been reduced to 40 in 2015-16. Andhra Pradesh Government has renamed Tirupati Airport as Sri Venkateswara Airport and Gannavaram Airport as NTR Amaravati Airport. The state government has also approved 600 acre land allocation for Bhogapuram Airport and 75 acres for Savita University in the capital Amaravati. Bihar government has pegged the Budget for the Tourism sector for 2017-18 at ₹109.87 crore, which is 84% less than the funds allocated last year. This comes despite tourism being identified among 10 priority sectors of the government under its Industrial Investment Promotion Policy, 2016. The cut is expected to hit government's plan to upgrade its hotels in the state. China has announced that its Military Budget this year will grow by about 7%, which is the country's slowest defence budget rise since 2010. The rise of 7% in the defence spending is basically in keeping with last year's GDP output. China's economic growth in 2016 was a nearly three-decade low of 6.7%. The states Punjab and Jammu and Kashmir have signed a Secretary level fresh pact for the fast-track completion of the much-delayed 206 megawatt (MW) Shahpur Kandi dam project on the Ravi river. INHS Asvini, Mumbai was adjudged the Best Service Hospital in the Armed Forces Medical Services (AFMS) for the year 2016. It was presented with the Raksha Mantri’s Trophy and Citation. INSViraat - the oldest serving aircraft carrier serving the Indian Navy for 30 years to be decommissioned tomorrow. China is going to build its first national underwater observatory in the disputed South China Sea (SCS). The observatory will allow China to keep a check on underwater physical, chemical, and geological dynamics in real time.